In more recent times, massive ice sheets at least one kilometer thick ravaged the landscape of the state and sculpted its current terrain. The Wisconsin glaciation left 12,000 years ago. These glaciers covered all of Minnesota except the far southeast, an area characterized by steep hills and streams that cut into the bedrock. This area is known as the Driftless Zone for its absence of glacial drift. Much of the remainder of the state outside the northeast has 50 feet (15 m) or more of glacial till left behind as the last glaciers retreated. 13,000 years ago gigantic Lake Agassiz formed in the northwest; the lake's outflow, the glacial River Warren, carved the valley of the Minnesota River, and its bottom created the fertile lands of the Red River valley. Minnesota is geologically quiet today; it experiences earthquakes infrequently, and most of them are minor. 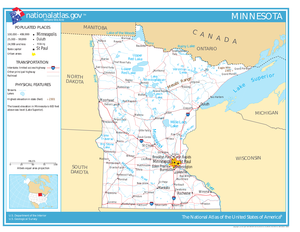 The geographic regions discussed here have combined elements from several of these various criteria to divide the state into areas recognized by the typical Minnesotan. Disagreements concerning the exact boundaries are to be expected, however the exact boundary definitions are not necessary to adequately define the state's regions. 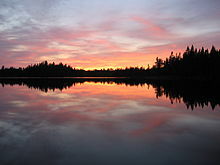 Large areas of the state are sometimes referred historically and politically as Southern Minnesota or Northern Minnesota to refer to areas outside of the Twin Cities Metropolitan area but stretch across multiple regions due climate, agriculture, political views, school systems and other relations. This page was last edited on 17 February 2019, at 17:55 (UTC).